Last week for Guess That Art 2 I shared Guernica by Pablo Ruiz Picasso (25 October 1881 – 8 April 1973). Yes, even genius artists have middle names and now you are one of the few outside of the art community that knows it. For once I have a real reason for putting the dates of a persons life. Picasso lived during some of the biggest and most wide ranging events in history. That range is reflected in his art, just as it would be in someone who was as forward searching as Picasso was. He was classically trained as an artist, beginning with his father. 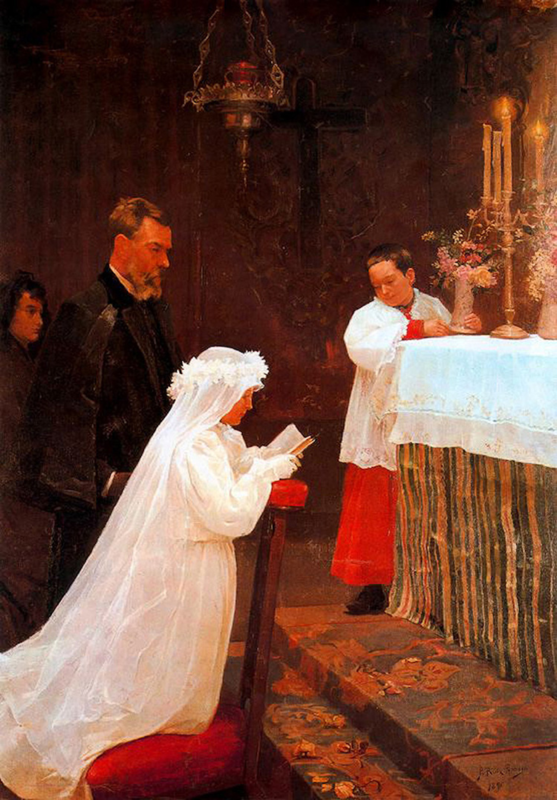 This piece from 1896 of his sister shows just how good he was with realism, something most of us don’t associate the name Picasso with. As the decades past he with through these different periods, often denoted by colors, his Blue Period, his Rose Period. He then had his African and primitivism period, which once you see examples of you can see the beginnings of Cubism, created by Picasso and Georges Braque. And Cubism is what people commonly know Picasso for. And that is where Guernica comes in. One of the most important pieces of Protest Art around, and what some have called “the Mona Lisa” of our time. Now onto Guernica. It’s not just a Cubist oil painting by a famous Spanish guy. It’s also a city in the Province of Biscay on the Atlantic in Northern Spain, the center of the Basque community. You see, Spain is made up of different regions, languages, and peoples. Not all of those peoples want to be, as they see it, unfairly. and often in history they have been oppressed or worse. Much worse. While Picasso was in France, Spain was in a civil war between the years 1936 and 1939. I’m not going to get in to that. My head hurts just thinking of how it all worked. Just know that a man named and his Nationalist won by 1939, and he stayed in power until his death in 1975, believe it or not. Franco, in 1937, gave the German Luftwaffe a target to test what it would take to level a city from the air. Most of the men of the town were away fighting in the civil war. The women and children were gathered in the town on market day. The Bombers dropped over 100.000 lbs of bombs and fighter planes shot anyone trying to escape. Picasso read the description of the horror when he read the eye-witness account of journalist George Steer on May 1, 5 days after the bombing. Picasso had been commissioned by Spain to paint a piece for the World’s Fair. 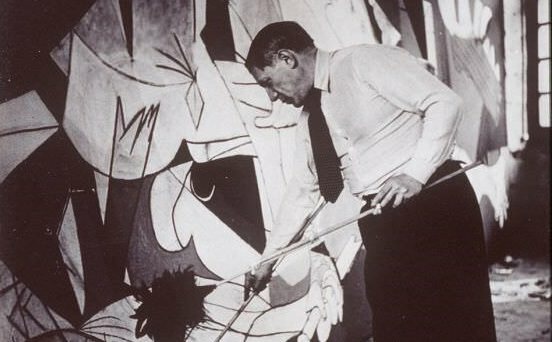 He had made sketches of ideas (The Dream and Lie of Franco) when his friend, Spanish poet and essayist, Juan Larrea dropped by and insisted he paint something about Guernica. Now, I believe you can see the symbolism throughout the painting. Picasso stated in an interview that in the painting that certain images were what they were and not symbols. But you can click here to see what some say about that. It’s not the nicest piece of Cubist art to learn how to interpret what you are seeing, but I think through its story the eye and mind grabs the details easier and can apply to other works.